Wisconsin Federation of Music Clubs is honored to have several awards that are ‘named.’ The awards are named to honor a past member and are funded by the family and friends of that member. These awards, or scholarships, are available to members who meet the application criteria. Applications are found under the name of the award in this website. As updates are made for these annual awards they will be posted so that you may prepare your application. Donations are gladly accepted for these awards, if you wish to do so. Contact our WFMC Treasurer, Susan Daniels in order to donate or fund an award of your own! Congratulations to Niyati Hansaria, a piano student of Olga Fillus of the Lake Country Music Club. Niyati has been studying piano, viola, and composition. She is a sophmore at Brookfield Central High School where she has been active in their symphony and chamber orchestras. She was a WSMA State finalist in 2018 for viola, a WFMC State first place medalist in 2018 in piano, and a Wisconsin Piano Arts Festival finalist in 2017 and 2018 for piano. In April Niyati will be performing as a principal violist at Carnegie Hall in New York City for her school chamber orchestra. We wish Niyati well as she continues her studies in music and music composition. 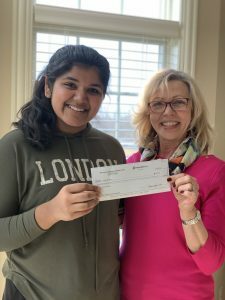 The $500 Ruth Kreuser Music Scholarship will help her in her efforts to share with others the love and appreciation of music. Senior Club Grants – (given to WFMC senior clubs who qualify for a grant in order to pursue outstanding special projects for the advancement of community music involvement, or appreciation.) Senior Club Grants due date has changed – it is September 1, 2018. Please contact the State Chair for the current form. In reality, the more donations the WFMC receives the more students we are able to recognize with a monetary award. Please contact our WFMC Treasurer, Susan Daniels, in order to make a donation for our young musicians.